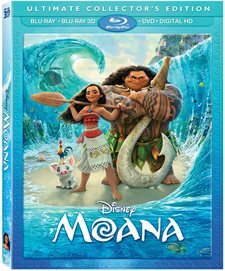 Download Moana in Digital HD from the iTunes store. Moana images are © Walt Disney Pictures. All Rights Reserved. Disney had a strong year movie-wise in 2016. From Zootopia to the sequel Finding Dory and Rogue One: A Star Wars Story to Captain America: Civil War, they had a full slate of quality movies, both animated and live action. Their year culminated in their strongest animated feature, Moana. From a great story to catchy music to amazing animation, not to mention a terrific cast, Moana reminds us why we love Disney films so much. If you have been anxiously awaiting to see the movie once more, your wait is almost over, as it will be out on Blu-ray (both 3D and traditional versions), DVD and Digital download this week. Maui (Dwayne Johnson; Furious 7) is a shapeshifting demigod who stole the heart of the Island Goddess Te Fiti, setting off a chain reaction that has led to the slow destruction of many of the ancient Polynesian islands. According to folklore, the only way to stop Te Fiti's wrath and destruction is to have Maui return the heart to her. However, Maui has since disappeared after he lost the heart, leaving the islanders with only the tale to tell children for many years. Moana (newcomer Auli'i Cravalho) has grown up on the Island of Motunui the daughter of the chief, being groomed to eventually take her place as chief and lead her people. However, she has a different calling and lusts after sailing the seas, which is forbidden. As a teenager, she finds old sailing vessels on the island and learns the truth about her people, which leads her to disobey her father and sail the seas to hunt for Maui so he can right the wrong he did so many years ago. Along the way, Moana finds her purpose and feels confident to lead her people back the great sailors and explorers they once were. 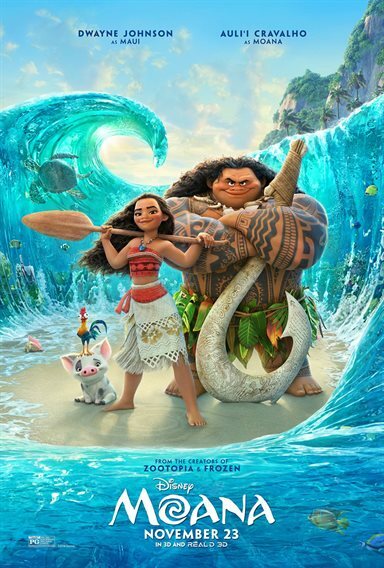 Led by veteran directors Ron Clements and John Musker (Aladdin; The Little Mermaid), the film is on some level a love letter to the South Pacific Islands, people, and culture. The research that was put into the making of the movie (as evidenced by the extras) show the level of detail Disney put forth to getting it "right". The costumes and customs are traditional and the animation of the people, the islands, and even the sailing vessels are well thought out and depicted. The music is catchy and traditional at the same time, blending the Polynesian vibe with a more modern feel. Created by singer/songwriter Opetaia Foa'I, Mark Mancina (Training Day) and, of course, Hamilton creator and star Lin-Manuel Miranda, the songs are beautiful, upbeat and carry a message many times. Anyone who sees the film will walk away not only remembering the music but come away singing the songs, which is a testament to this very talented group of collaborators. The talent on this film knows no bounds and special consideration must be given to the young and talented Cravalho. Her sweet, yet powerful voice is just the right blend to play the young chieftain/adventurer and vocally portray a confidence that surpasses her years, while still offering some of the innocence of a girl her age. Johnson is well suited to this role as the over confident and cocky demigod who imbues the story with much of its humor. And let's face it… who knew "The Rock" could sing?!? The movie is best experienced in 3D, as the flora and fauna of the island pops out at you, immersing you into this beautifully animated world. The video is set out in 1080p high definition video with a 2.39:1 aspect ratio, which of course makes the quality excellent, and since the film is animated, the colors are magnificent. The DST-HD master audio 7.1 highlights the aforementioned music beautifully, which is a real treat to enjoy (and even sign along to… though I suspect the "sing-along Moana Blu-ray" will be released at some point). The Blu-ray offers several interesting extras to enjoy. Besides a deleted song called Warrior Face, there is also an audio commentary, deleted scenes and the music video for How Far I'll Go. The other extras are far more entertaining and informative, including Voices of the Island that showcases the beautiful islands of the south Pacific; Island Fashion that discusses the themes and traditions of Polynesian clothing; The Elements of… which is broken into several subcategories and looks at things like special effects in the film; and, of course, They Know The Way: Making The Music of Moana showcasing the three gentlemen involved with creating the incredible soundtrack. There are also two short films to enjoy – Inner Workings, which was presented before the movie in theaters and Maui Mini Movie: Gone Fishing, which is a cute two-minute look at Maui and the sea. If you love Disney animated movies, or if you have small children at home... heck, even if you don't meet either category, this is a movie you'll want to own. It's a new Disney classic and should be enjoyed over and over again. I love it so much, I went home and learnt all of the words to all of the songs in Moana. This is my faveroute film it's amazing I have watched it at least 4 times, love it !